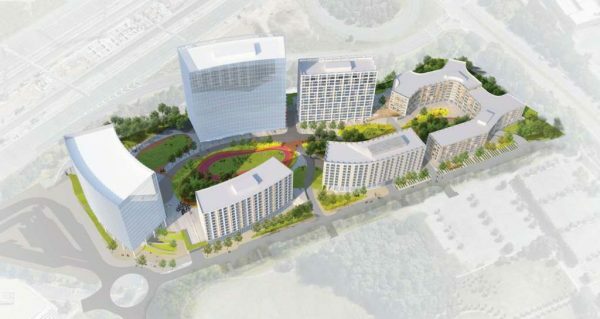 Tishman Speyer, a New York-based real estate company, hopes to transform more than 14 acres of land in the southwest quadrant of the Dulles Toll Road and Reston Parkway into a vibrant, mixed-used development driven by the power of the adjacent Reston Town Center Metro Station. Reston Crossing, the name of the transit-oriented development, would bring six new buildings organized around a central park and other public amenities to the land, which is currently home to two office buildings. The proposal, filed with the county early this month, requires rezoning the land from medium industrial use to planned development commercial to allow for up to nearly two million square feet of development. Elizabeth Baker, a senior land use planner with Walsh Colucci Lubeley & Walsh, a northern Virginia law firm that specializes in commercial real estate development, said the transit-oriented project is set apart from nearby buildings that are more suburban-style, traditional office buildings built in the 1980s and 1990s. “With the coming of the Silver Line and the plan that was adopted by the county… we’re just trying to implement that vision,” Baker said. The plan calls six buildings includes one on the west with up to 30,000 square feet of retail, pedestrian access to the Metro Station South Pavilion, a U-shaped residential building with up to 380 multi-family residential units that overlook the central park, a building on the southeast with between 180 and 230 residential units, and a building on the south with up to 250 residential units. “With a variety of park experiences, some landscaped, others hardscaped, and a well-developed system of paths, passive, and active recreation facilities areas, the Central Park is a major community amenity. Office, residential and retail uses front onto the Central Park, allowing it to be a gathering space for workers, residents, shoppers, and visitors alike,” according to the Dec. 8 proposal. Of the overall development, office development would range from 38 percent to 58 percent, residential development would range from 36 to 59 percent, and retail uses would range from three to six percent. The plan is intentionally flexible due to changing market conditions.